Passwords are one of the easiest things we love to hate. A necessary evil of the modern age, passwords are the key to a person’s online persona, and ultimately, their identity security. Whether it’s your work apps, your Facebook account, or even your bank, everything seems to need a password. And, with all the resources that require passwords, the number of passwords grows and grows, (the average business user has 191 passwords) becoming a practically unmanageable mess of letters, numbers, and special characters. Wouldn’t it be nice to have one highly secure identity that works for all passwords? 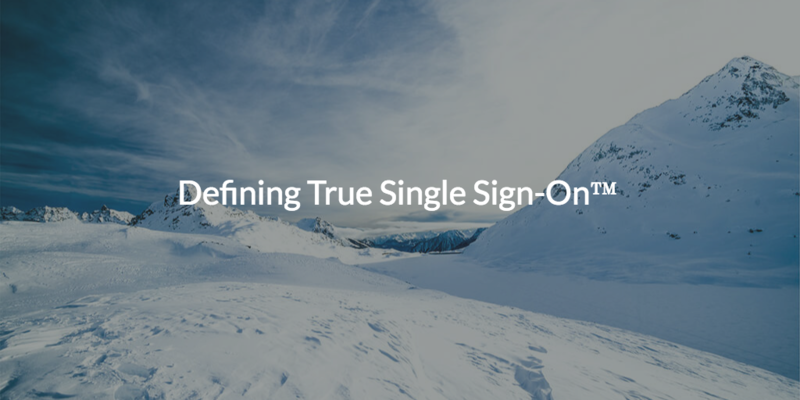 Sounds like you’re defining True Single Sign-On™. Single sign-on (SSO) is the ability to log into various accounts and applications by leveraging one set of credentials. Traditionally aligned with web-based applications, SSO is also called Identity-as-a-Service (IDaaS). SSO promotes productivity in the workplace by reducing the amount of time an employee spends typing in their passwords into the variety of resources they use. Additionally, SSO removes the burden of remembering countless passwords by managing them all in one solution. Long before SSO, user identities in the workplace were managed by directory services such as Microsoft® Active Directory® (MAD or AD). In those days, since everything was based on-prem and on the Windows® OS, Microsoft’s legacy directory solution fit the bill to a T. With AD, users could easily connect to their necessary resources, like Office™, Exchange™, and Outlook™, with one unified identity. That identity, however, became fragmented with the advent of the cloud. Web-based Software-as-a-Service (SaaS) applications quickly became the norm for businesses worldwide. Given that SaaS apps could be leveraged by almost anyone, anywhere, it made sense that they became so widely adopted. AD had no way of extending user identities to the cloud, so a new solution was needed. Subsequently, SSO providers hit the market in force. Designed to be layered on top of directories like AD, SSO solutions act as a bridge between legacy on-prem solutions and web-apps in the cloud. Unfortunately, modern SSO tools are no silver bullet. For instance, for already busy IT admins, adding SSO solutions to an organization comes with a considerable cost to both their schedules and pocketbooks. Additionally, SSO softwares cannot usually authorize identities on systems or other non-app resources (e.g. AWS servers, on-prem legacy apps, WiFi, and more). For companies that leverage both Active Directory and Mac® or Linux® systems, this presents a point of consternation given that AD struggles with authenticating non-Windows systems..
An ideal single sign-on would leverage one identity to authorize access to everything, wouldn’t it? 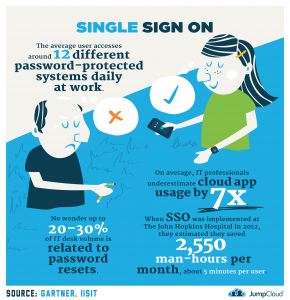 That is the definition of True Single Sign-On, available through JumpCloud® Directory-as-a-Service®. 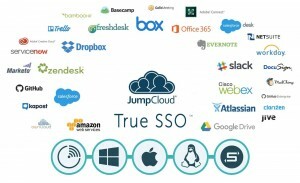 JumpCloud Directory-as-a-Service is a cloud directory service for the cloud era. With LDAP, SAML, and RADIUS protocols among others, JumpCloud connects users to applications on-prem and in the cloud, as well as to their WiFi networks. That means that users can use communication tools like Slack, dev platforms like GitHub, helpdesk software like Freshdesk, and cloud infrastructure like AWS® with one unified identity. JumpCloud also provides endpoint management, and, as a third-party service, does so regardless of platform (Windows, Mac, or Linux). To learn more about how Directory-as-a-Service is defining True Single Sign-On, be sure to check out our YouTube channel or contact us with questions or concerns. If you want to see all that JumpCloud True Single Sign-On has to offer, you can sign up for Directory-as-a-Service today. Signing up is completely free, and so are your first ten users.